An octave includes all musically relevant tones, be it the Western well-tempered scale or the Middle-Eastern quarter-tone system. Beyond an octave, it's all repetition at either twice or half the frequencies; ad infinitum in either direction or in our case, to the limits of our human hearing. When a hifi company calls itself Octave—no 'audio, 'lab' or 'sound' required—it tells us a lot. "The name's Octave; just Octave." Where's Sean Connery when you need him most? 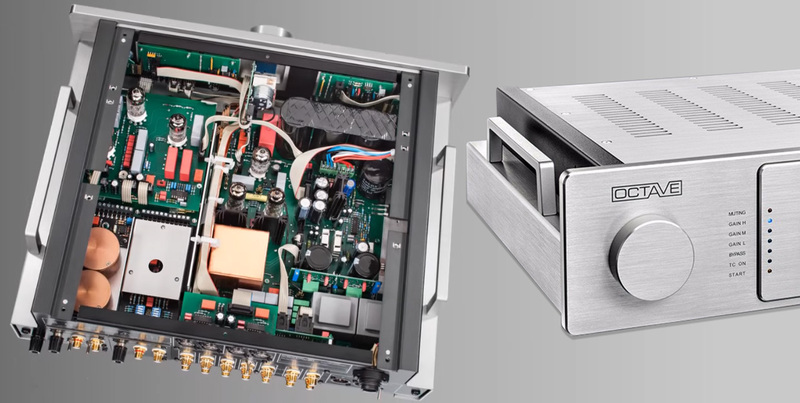 Our hifi provocateur turns it up to chromatissimo glissando with the modular HP700 full-function preamplifier. Be it MM or MC phono, true balanced inputs with inhouse-wound transformers, a choice of standard or 47-position stepped attenuator, RCA/XLR outputs, balance and precision tone controls - this beast with outboard power supply can be configured to do it. Being Octavian naturally means valves. That's what this German electronics house has always been about. As the opening shot suggests—replace Focal speakers with Triangle, Dynaudio or other real-world loads—Octave gear needs no mollycoddling to perform. From that the thinking reader immediately suspects push/pull pentode or tetrode amplifiers and would be correct. Just so, boss Andreas Hofmann isn't ignorant of SET's market share. "The High End 2016 show in Munich was more or less business as usual. For us this year will be more interesting as we'll demonstrate the new Miniwatt single-ended integrated amp. This combines a 'normal' 10wpc SET plus headphone amp but I'm running KT88 or KT120 outputs. For a year now I've been working on 300B and tetrode SE designs." It goes without saying that the reasons why Herr Hofmann's engineering brain is unusually 'allergic' to traditional SE amps is their high output impedance, high THD, low power and higher noise floor. He dislikes high distortion and faulty compromised drive. As someone who believes in unimpeachable measurements plus the ability to play speakers of normal or even low efficiency at high levels without resorting to girls and guitars, the entire zero-feedback SET mystique is still foreign to him. But requests from foreign distributors have him investigate whether the breed can be elevated to Octave's stamp of approval. 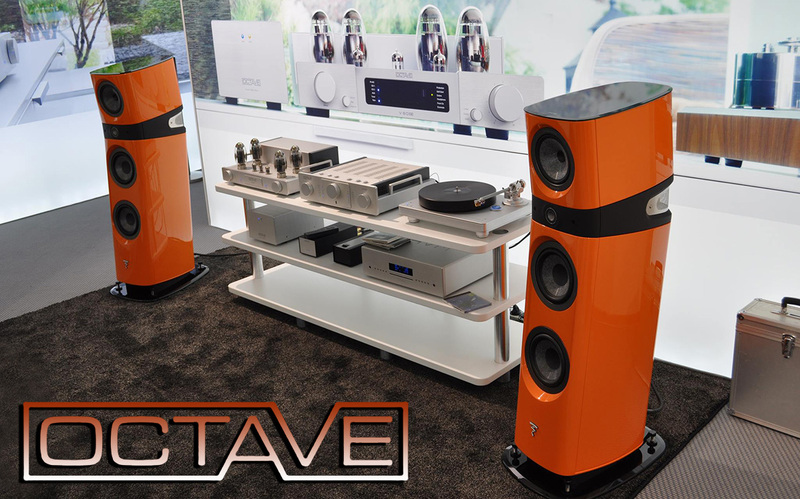 In general then, one might think of Octave as Germany's VTL: tube gear modernized for the 21st century, its loudspeakers and our bass-heavy music. It's not about the vintage Quad aesthetic. Back to the HP700, three selectable gain settings are high at x 18.5/25dB, medium at x 7.8/18dB and low at x 4/12dB. Bandwidth for high gain is 10Hz-200kHz -0.7dB or 0.7MHz @ -6dB. For medium gain, it's 10Hz-200kHz @ -0.3dB or 1.2MHz @ -6dB. For low gain, it's 10Hz-200kHz -0.2dB or 2.1MHz @ -6dB. THD at all gain levels is a low 0.01%/3V/10kΩ. SN/R is -98dB or 38µV for high, -104dB or 18µV for medium and -110dB or 8µV for low gain, all at 3V out. Input Ω is 50kΩ. 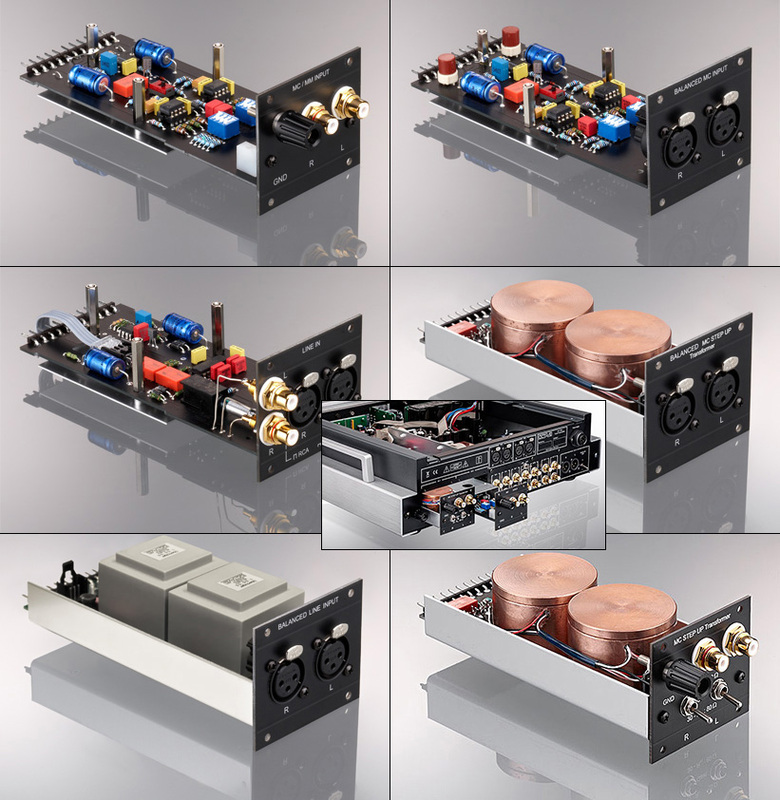 The external power supply includes multiple shielded toroidal transformers and incorporates an AC mains filter. To condense the essentials: mega bandwidth meets low distortion and low output impedance just as you'd expect from a modern preamplifier regardless of gain devices. Herr Hofmann takes particular pride in the linearity of his circuit including the optional balance and tone controls. A click to this page shows why. More capacitive filtering applies to diverse secondary voltage feeds and the Octave-wound power transformer is potted to minimize stray radiation. A metal remote pets just volume. In modern parlance, the HP700 is an end-of-life product; an aspirational effort; a luxurious proposition for the been-there-done-that customer. Even when reviewers can't afford half the gear they're so clearly privileged to host over the short term, it's always titillating to learn how the other half lives. To said end, Herr Hofmann suggested that I add their RE320 stereo amp with optional Super Black Box or SBB for short, a massive capacitive upgrade to optimize low-impedance drive and current. * Other plug-in alternates for the D3 bias setting are the E180F, E280F and E282F pentodes. ** "In the published photos of the open HP700, you see only five tubes because the phono input tube is hidden beneath the left grey side panel. This tube is located near the red array of small caps. You will see only a small part of the tube socket. 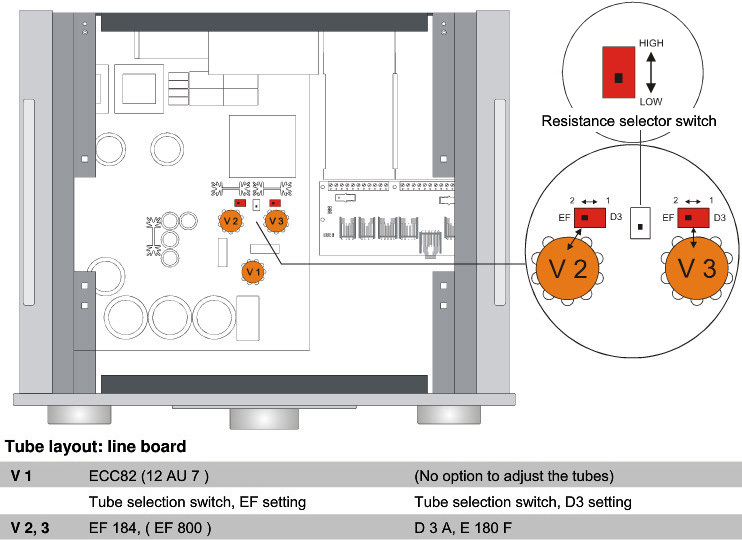 In case of the optional control module, there is an additional tube as part of the tone control circuit but this tube is hidden under the tone control plate and you cannot see it. Of course it's possible to replace this tube without dismantling the control module."